Your wedding day is a time for rejoicing and merriment and it is important that you are well prepared in advance for this big day in your life. Stress, fatigue, and anxiety are common symptoms that can occur for weeks leading up to the event. These few tips will help you to keep your composure on your very important day and prevent you from turning into a Bridezilla. Avoid Long Drawn out Conversations about the Wedding – One habit that seems to occur in those about to get married is the endless conversation about wedding plans. If someone asks you how the wedding plans are coming along, answer in a couple of sentences. If they want to know more, they will ask you. There is no sense in giving them a 30 minute monologue. The wedding may be the most important thing in your life right now, but it isn't to most other people. Make a Budget and Stick to It – Once you figure out your budget, stick to it. Each and every upgrade will add expense to your budget. These expenditures can quickly add up and end up costing you a couple of thousands of dollars more. If you stick the expense on a credit card, it may ruin the honeymoon and the beginning of your marriage. Your wedding reception really is JUST a party. You could have 17 ice fountains and 52 doves released at the moment you both say “I do”, but that isn't going to do anything to help your marriage go the distance. Remember How Your Parents Feel – It is important to acknowledge what your parents are going through. You are still your parents child and no matter how much they smile, they know that they will lose you on your wedding day. Try to understand how they feel and be compassionate about it. 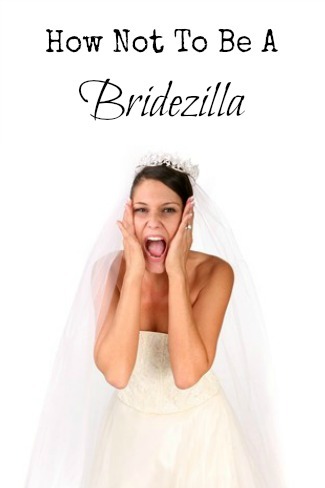 Remember that is is NOT all about you – I don't care how popular it is to be a Bridezilla. To the rest of the world, you are just a spoiled brat and everyone will loathe being around you if you are only concerned about the wedding and “your big day”. The rest of us have lives. Get over yourself! Although there are many other things that you can do or not do to avoid turning into a Bridezilla on your wedding day, the above 5 tips will ensure that your day will go as well as planned. It is normal to be nervous, frustrated, and overwhelmed. Many people are overcome with human emotion at weddings. These tips should help your day run smoothly as possible.